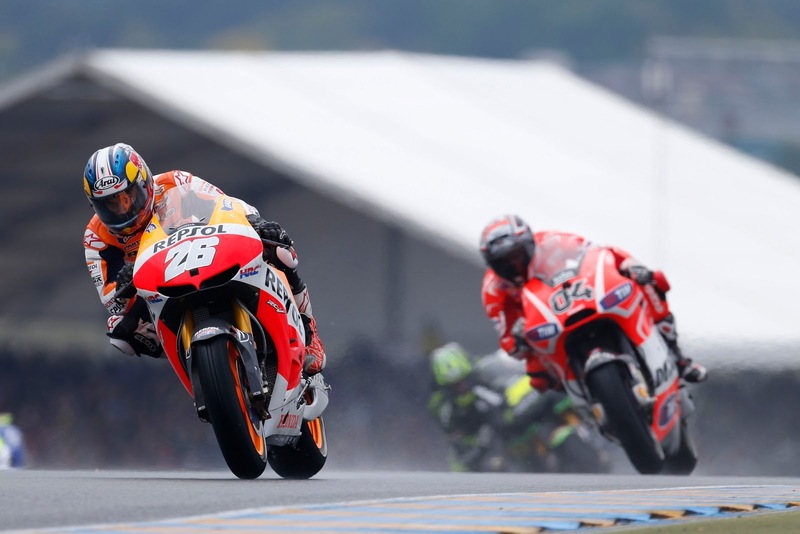 Repsol Honda’s Dani Pedrosa mastered the tricky conditions that faced the MotoGP field at the historic Le Mans circuit in France this afternoon, taking his second successive victory of the season after one of the best MotoGP races of the year so far. After a somewhat tentative start in the wet conditions Pedrosa managed to drop in to third place by the first chicane behind Dovizioso and Lorenzo; after passing Lorenzo it was a see-saw battle between Pedrosa and Dovizioso as both made mistakes on the greasy track but it was on lap 14 that Pedrosa made the telling move and immediately set about opening a gap on the Italian, who had no answer to the wet-weather specialist. Pedrosa took the win by 4.863s from Crutchlow and with it the lead in the title race from team mate Marquez, Pedrosa also matched Lorenzo and Wayne Rainey with victory number 24 in the premier class and with it became only the third rider ever to surpass 3000 career points after Loris Capirossi and Valentino Rossi to round off a very successful day. At the same point last year Pedrosa trailed Lorenzo by 25 points whilst this year he leads the Mallorcan by 17 points and, with a run of form that’s seen Dani win eight of the last twelve Grand Prix, setting up a solid championship assault and giving all-important confidence ahead of the Italian MotoGP at the picturesque Mugello circuit in two weeks time. Previous Previous post: Rossi "I felt a bump and lost the front"
Next Next post: Redding: "It’s an amazing feeling"